This fort can be easily accessed from Pachnai village which is the base village for Harishchandragad fort. As this fort lies on a side and the route being hard it is very less visited. The ridge from where the ascend has to be done faces East direction and hence it is advised to start the trek during early hours to avoid heat stroke. The base village of this fort is Pethewadi which is 07 kms from Pachnai. The accessible route to the fort is about 05 kms from Pachnai. This can be easily identified due to a cement structure built by the forest department. One can reach till here by foot or by one�s private vehicle. The ridge of the fort hill runs North-South direction and from here one has to start the ascend. A 10 minute walk gets us to an open space where couple of stones can be seen painted with vermillion. Rock cut steps from here take us to the rock cut holds in about 30 minutes. This ascend is bit tiresome. These rock cut holds are very narrow and cut diagonally enough to accommodate only one foot. Extreme caution has to be excercised while ascending this rock patch. After this climb we come across Bhairoba�s cave which is carved in rock and sits below ground level. In this cave there is an idol of Bhairoba painted in vermilion. There are 2 sculptures of snakes outside. After visiting this one has to proceed towards south on the narrow path by keeping the valley to the left and the fort hill to the right. A 5 minute walk leads to two water tanks carved in rock which are now filled with fallen rocks. Proceeding further there two large rocks round in shape and a small temple named as �Vetal cha Challa�. From here, head back to water tanks and another route from here leads to the fort summit in about 5 minutes. The fort summit is narrowing to the south and broad to the north. Harishchandragad can be seen to the east. It takes about one hour to visit the entire fort. 1) Reach Otur from Mumbai-Kalyan-Murbad-Malshej (159 kms). A road passing by the S.T. bus stand of Otur goes further to Kolthe village (base village of Kolthe Bhairavgad) via Bamanwada � Kotul (30 kms) � Vihir (base village of Kunjargad) � Kolthe (25 kms). 5 kms from Kolthe is a diversion for Pachnai village and Pachnai is 7 kms further from this junction. The base village of Kaladgad i.e. 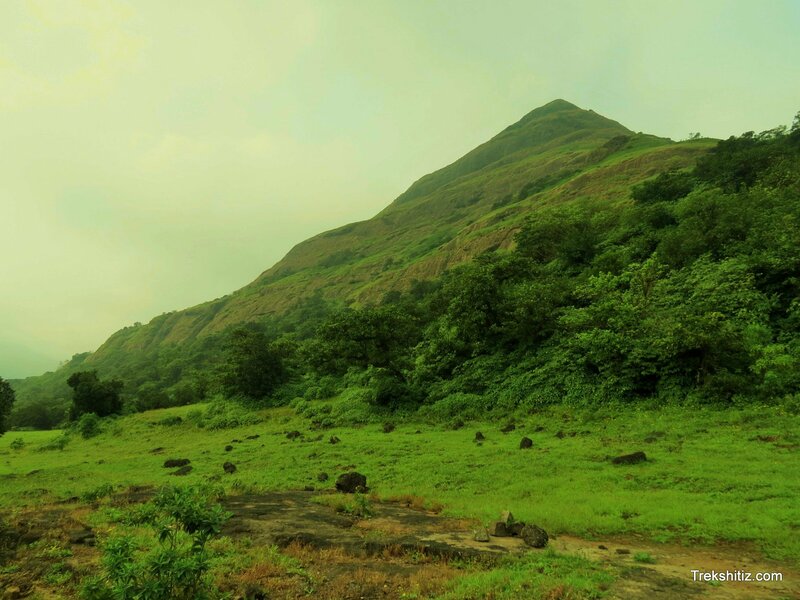 Pethewadi is 7 kms from Pachnai but the route to access the fort is at 5 kms from Pachnai. 2) Reach Rajur from Mumbai � Igatpuri � Ghoti � Bhandardara � Rajur (155 kms). On the Rajur � Kotul route, Pachnai is 27 kms via Rajur � Manik Ozar � Khadki � Waghdari � Pachnai. Available in Pachnai village at 10 kms. It is advisable to carry a 40 ft long rope for safety reasons. Rainy season should be avoided to visit.